When the guns fell silent on the 11th November 1918, they marked the end of the bloodiest conflict ever fought by Britain. Every family in Britain felt the indelible mark of this war, with over five million men and women serving in the armed forces. With a First Class Degree in War Studies from King’s College London and years of experience researching at both the British Library and National Archives, I am proud to offer a personalised First World War soldier research service that brings a soldier’s past to life. There are a range of research options available, depending on whether you need a complete soldier’s history or just a file photographed. For more information, please read: First World War Soldier Research Service. I have written a number of guides to enable you to conduct your own research into a soldier, whether they served in the British or Indian Army. I realize that many begin their search with a relative’s medals, so I have written a comprehensive Guide to World War One Campaign Medals. My great-grandfather’s medals. 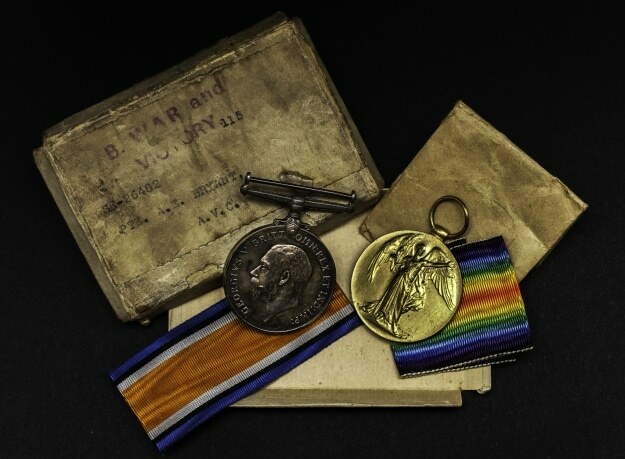 These medals and the packaging contained all the information I needed to start my research into his First World War service.